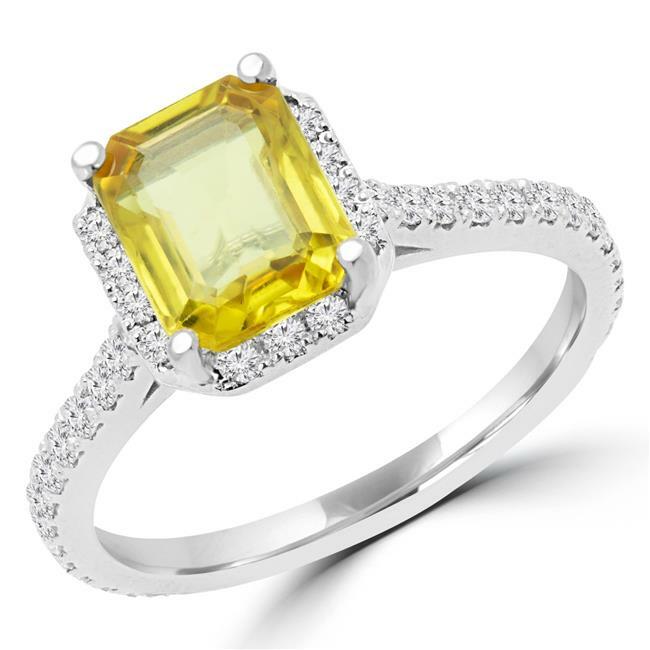 Bold and sophisticated, this gorgeous radiant yellow sapphire cocktail ring has some serious sparkle. It will add a burst of color to any outfit, elevating that wow factor and drawing people to you the moment you enter the room. What a divine accessory to add elegance to your casual wear and make your best evening gown look even more divine. Striking cocktail rings are always a style staple and this one is a must-have for any social butterfly who has a love of the luxurious things in life. A perfect choice to put a permanent smile on someone's face (including your own), this 2 1/4 CTW Radiant Yellow Sapphire Cocktail Ring is crafted in lustrous 14K white gold and boasts a triple AAA yellow sapphire surrounded by a halo of magnificent white diamonds that also shimmer along the ring's band. The diamonds have a very good cut with a G-H color rating and S12-I1 clarity.